Smartphones come with more internal storage these days, but sometimes that just isn't enough. For those devices with the necessary slot, a microSD card can allow you to carry a massive media library around in your pocket. You can get some of the fastest cards out there today for a nice discount. Samsung's EVO Select cards are all on sale. The smaller ones are just a few bucks off, but you save more on the larger ones. Having more storage is never a bad thing, but that doesn't mean you should buy it on a whim. It's smarter to wait for a big sale, like we have today on Amazon Goldbox. A variety of SanDisk cards and flash drives are on sale for up to 71% off. I'm a fan of microSD card slots. I know, I know, there's absolutely no reason to have this debate right now. You either prefer to have expandable memory or you don't particularly care. 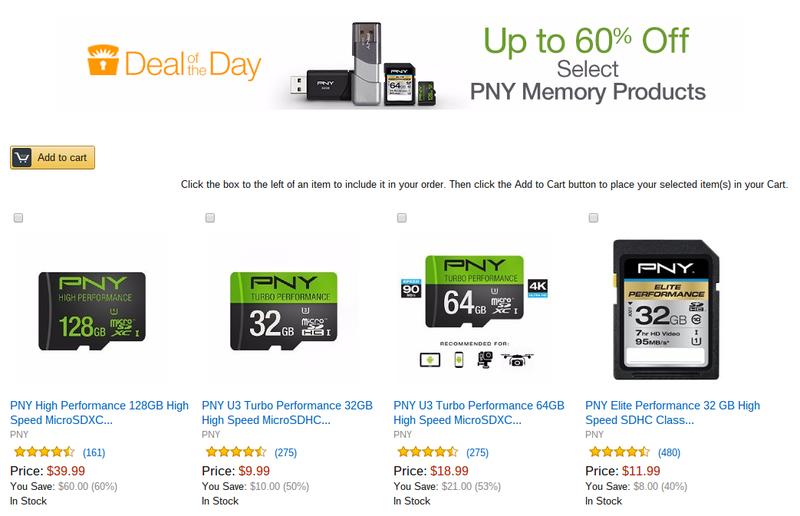 If you're on #TeamGiveMeMoreCheapStoragePlease, then now may be a good time to head over to Amazon. 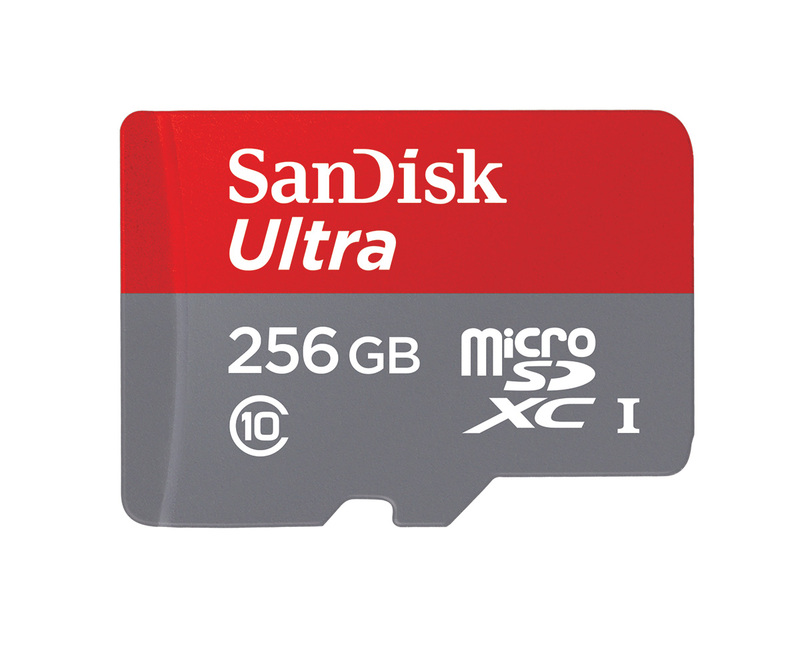 Phones are increasingly shipping without microSD card expansion slots, but you can still stick it to the man by getting cheap expandable memory for plenty of devices. Today you can save a few bucks on Transcend microSD cards on Amazon. 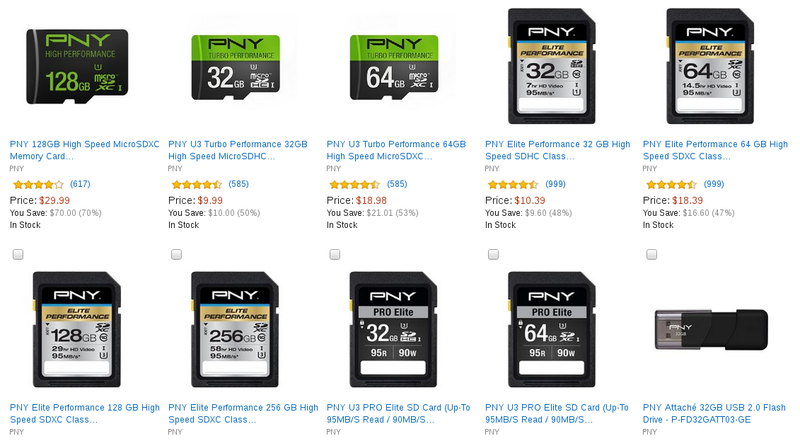 The 64GB and 128GB varieties are on sale for up to 72% off full retail. Flash memory comes in many different forms. You have microSD cards. You have full size ones. Then there are flash drives. There's expensive, and then there's cheap. I like the latter. If you do too, now's a good time to hit up Amazon. 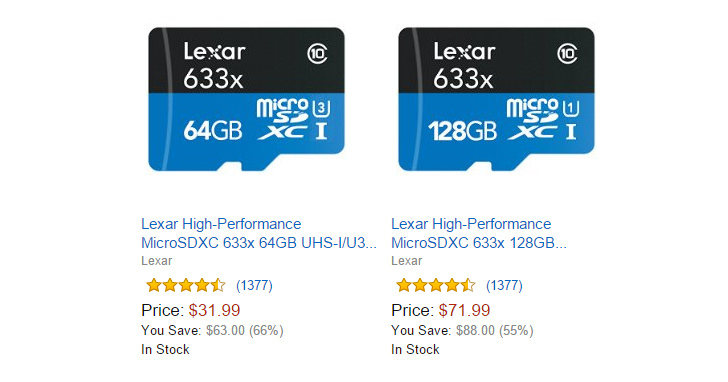 Amazon's Gold Box deal today includes a ton of flash memory from Crucial and Lexar. However, most of it is of little relevance to Android devices. I mean, unless there's a phone or tablet with a 2.5-inch SATA drive I'm not aware of. What you can get are these Lexar microSD cards. They're up to 66% off. In the tech world, we know that big things can come in small packages, but those packages usually have a big price. 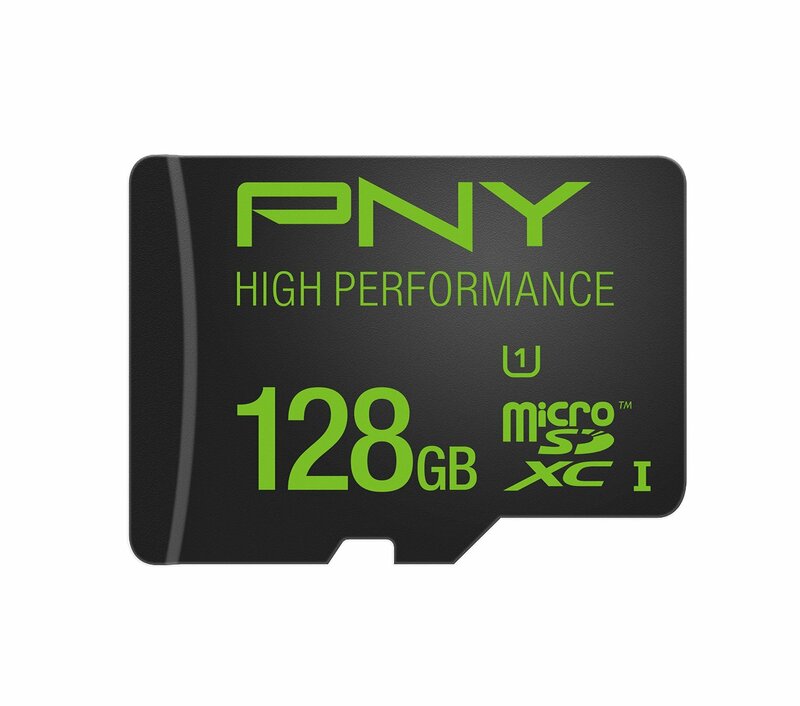 Well if you are looking for microSD cards with a ton of storage space, today is your lucky day because both Amazon and Newegg are is offering an over $30 discount on a PNY 128GB microSD card perfect your phones, tablets, action cameras, or wherever else you might need it. Newegg created a splash by offering the discount and Amazon answered in kind by dropping their own price; now that Newegg has sold out, you can be thankful Amazon is still competing. 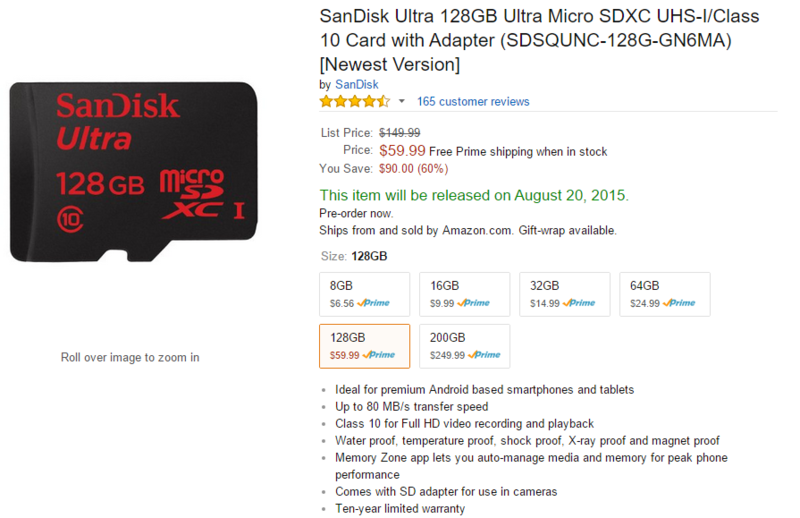 SanDisk is rolling out new Ultra series microSD cards, and the pricing is pretty fantastic. The sweet spot is a new $59.99 128GB option, but the smaller cards are selling for good prices right now too. If you've got a card slot and need a lot of storage, this is kind of a no-brainer. Android M is going to have some interesting new tools for fans of MicroSD cards and expandable storage in general. 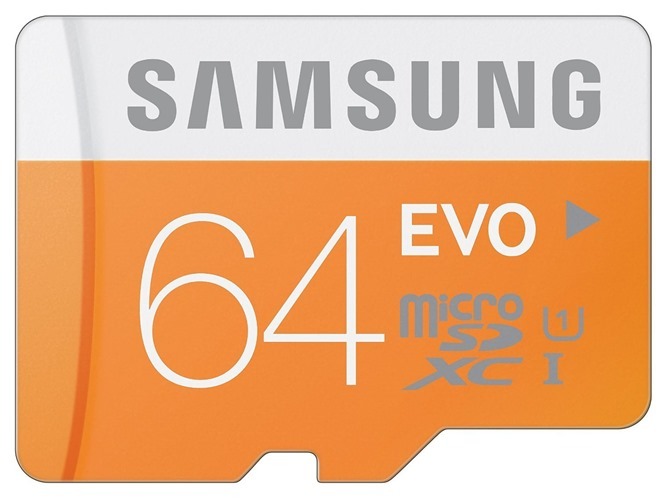 If you're looking for some cheap SD cards, Amazon is selling official Samsung-branded storage today... an unfortunate and cruel circumstance for owners of the Galaxy S6. 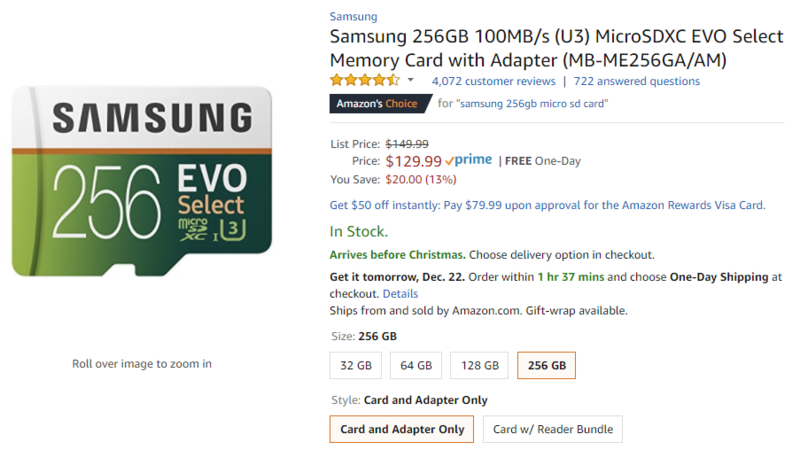 Anyway, Amazon's selection of EVO cards has a few very good deals at the moment, particularly this 64GB Class 10 MicroSD card for just $19.57. That's a fantastic price, and one you'd be hard-pressed to find elsewhere. If you don't need quite that much extra storage, a 32GB version of the card can be had for $12.99, and a 16GB version is going for only ten bucks.